Emmanuel Catholic College students at the Inspiring Girls forum. 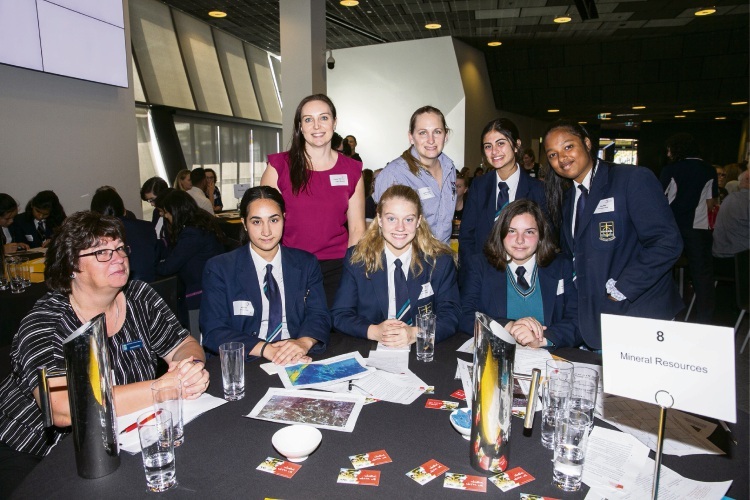 INSPIRING girls from WA high schools had an inside look into job opportunities in the resource sector at a careers forum last week. Students from Emmanuel Catholic College were among 100 students who attended the Chamber of Minerals and Energy’s Inspiring Girls forum at RAC Arena on March 29. The forum featured presentations from Women in Resources Awards finalists and winners and hands-on activities such as a ‘speed careering’ session. One of the 2019 finalists, Stephanie Allan, addressed the students about her role as an operations technician on Chevron’s Gorgon project on an A-class nature reserve. Chamber chief executive Paul Everingham said the forum allowed students to interact with industry representatives who love working in the sector. “What we are trying to achieve with the Inspiring Girls initiative is to increase awareness of the range of diverse and exciting resources career pathways, as well as promote the benefits and opportunities for women working in the resources sector,” he said. “CME is committed to promoting workplace diversity and promoting career opportunities for everyone.